Our Sebring, FL Hotel's Staff Welcomes YouWhile staying at the Holiday Inn Express Hotel & Suites Sebring, you'll not only experience an excellent location near several area attractions, but also a knowledgeable staff who make sure you feel at home.Thanks to our hotel's location in central Florida, we are near several area businesses, ranging from Winn-Dixie to Walmart. We are also close to Avon Park Air Force Range, as well. Our facilities also feature an on-site Business Center with print and copy services, along with a 625-square-foot meeting room.For leisure travelers, historic and charming downtown Sebring is just a short drive away and is home to numerous shops and restaurants. Sebring International Raceway, also nearby, is host to several exciting, must-see races. Our hotel's guests can experience Central Florida and its beauty by visiting the Highlands Hammock State Park, home to horseback riding and hiking trails, or take a guided fishing charter to try the area great fishing. The Highlands County Sports Complex is just a short drive away, too.To help you stay connected, we provide free Wi-Fi access throughout our hotel's accommodations. While in Sebring, FL, our hotel's patrons can start their day off the right way by visiting the complimentary, hot Express Start Breakfast Bar. 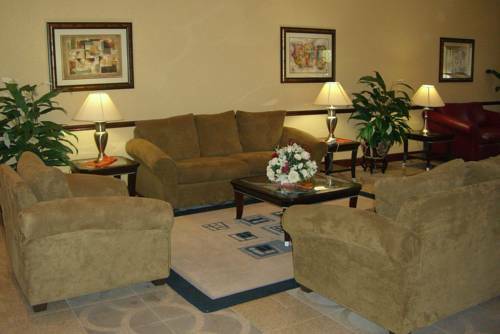 Our amenities also include a coin-operated washer and dryer, as well as an outdoor pool and a Fitness Center. We hope to welcome you soon!